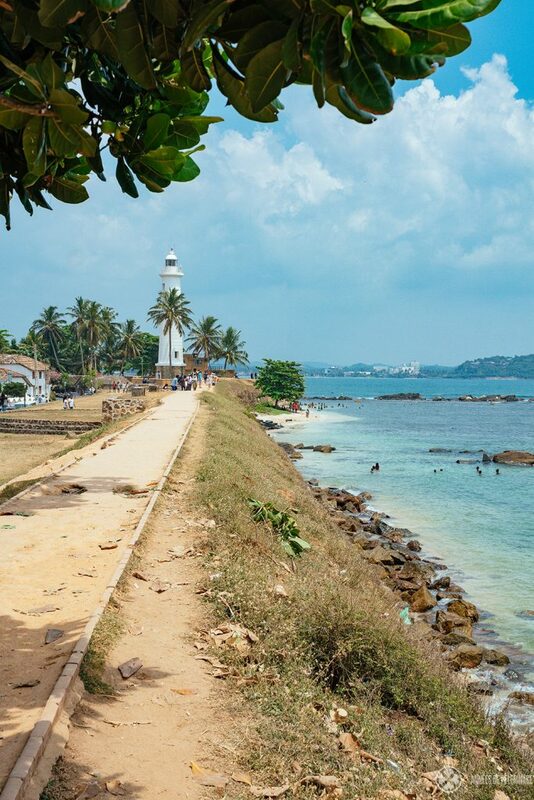 Are you wondering what to do in Galle? 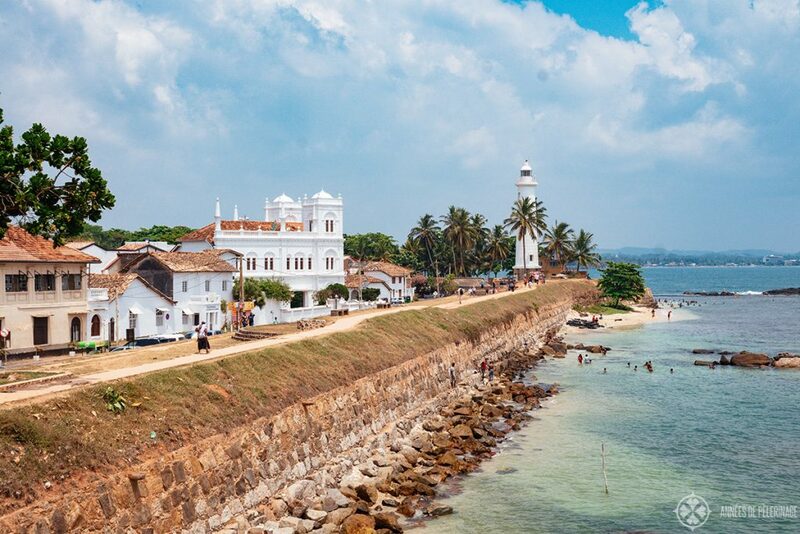 Are you unsure how many days you should stay or if a day trip from Colombo to Galle is all it needs? Then I’m sure my little Galle travel guide will be able to answer all your questions. 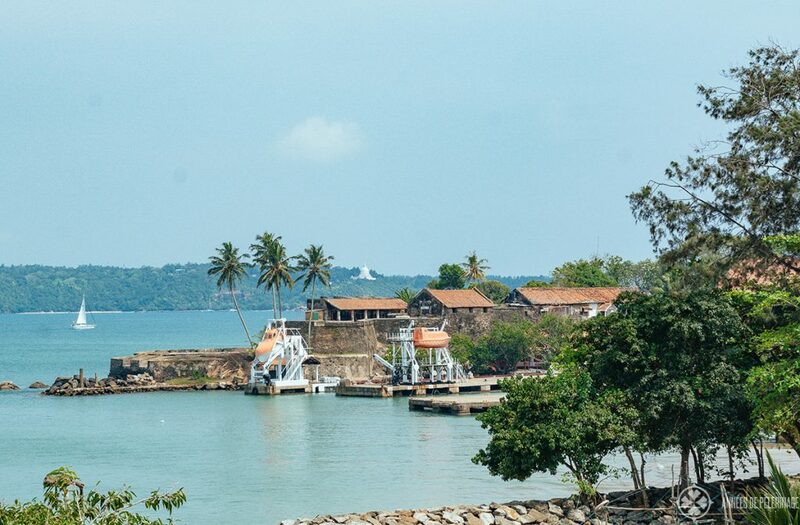 For me, the enchanting little small town and the remains of the Dutch Fort might just be the most extraordinary spot in the country and thus a must stop in any Sri Lanka itinerary. 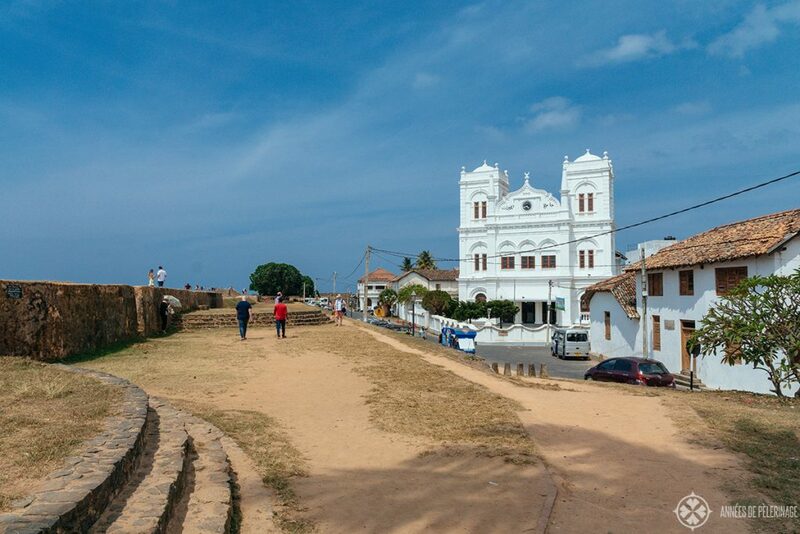 The city is not very big, but there are still quite a lot of things to do in Galle. Galle Fort is a unique UNESCO World Heritage site and probably the single reason most people come to visit the town. 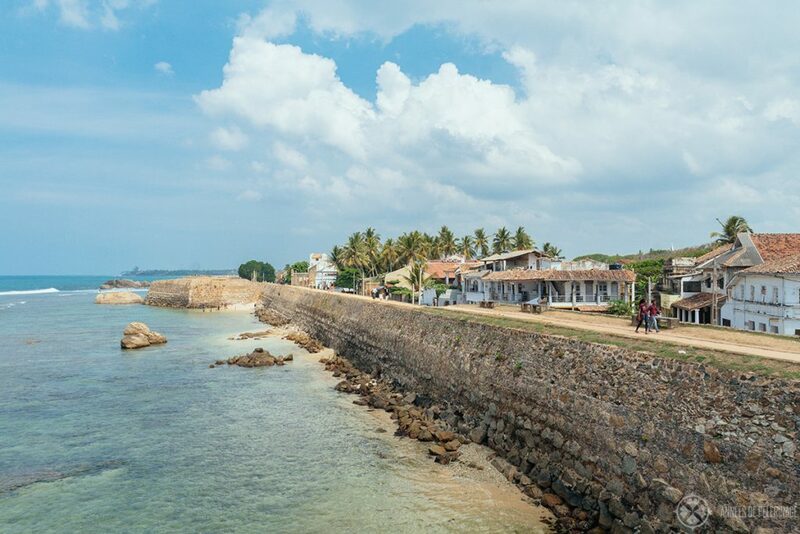 Construction started in 1588 by the Portuguese, though the Bay of Galle served as a port for the locals ever since around 125 AD. Later, in 1640, the Dutch captured it from them and further fortified the place. 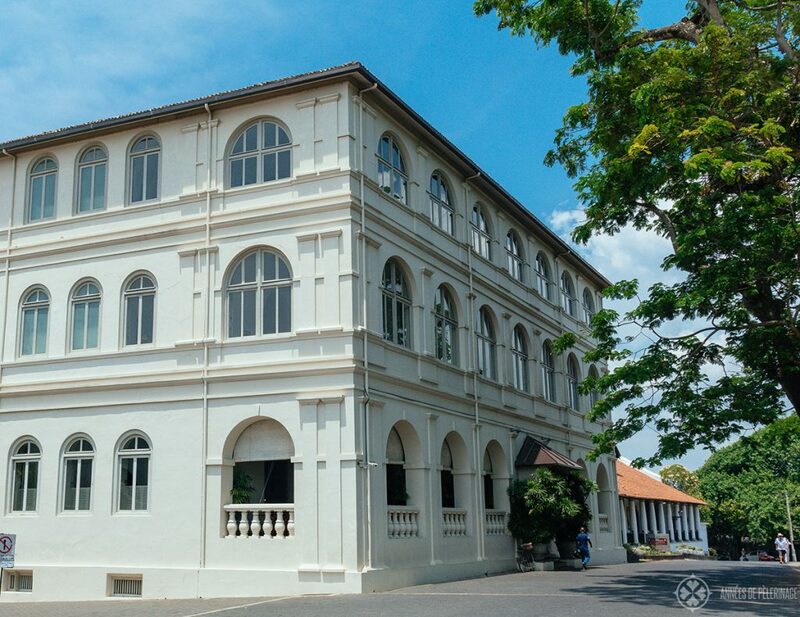 But that’s not the last of Galle’s moving history. 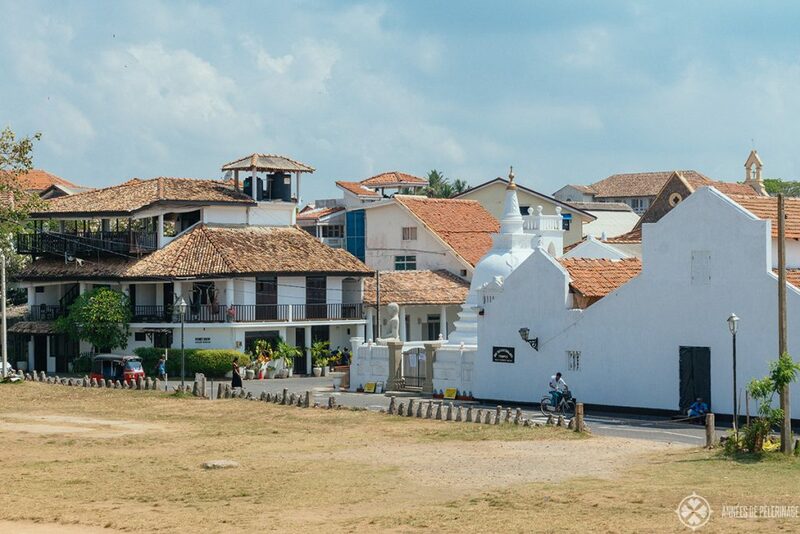 In 1796, the British took control and shaped much of what you see in Galle today. The best way to breath in all that history is by walking along the outer ramparts of the Fort. 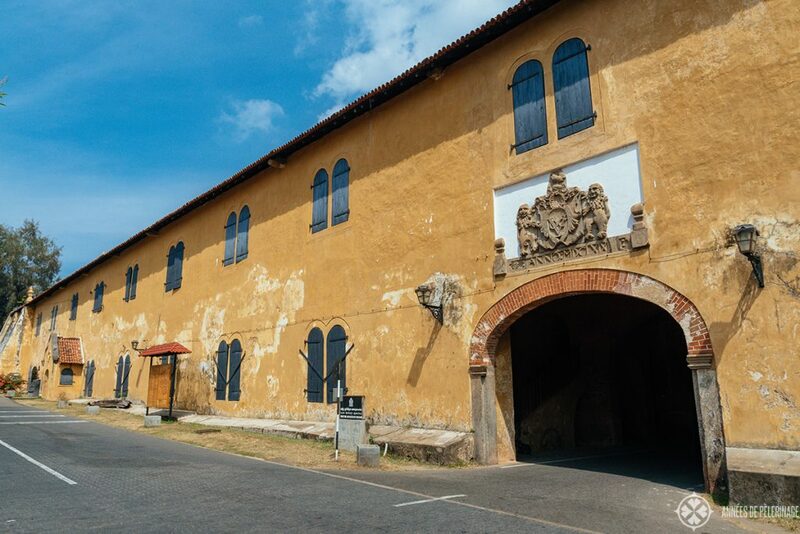 You’ll be able to see the Zwart Bastion (the black Bastion) from here, and you certainly shouldn’t miss the Dutch Hospital either, which you will also find at the far eastern end of your tour around Galle Fort. 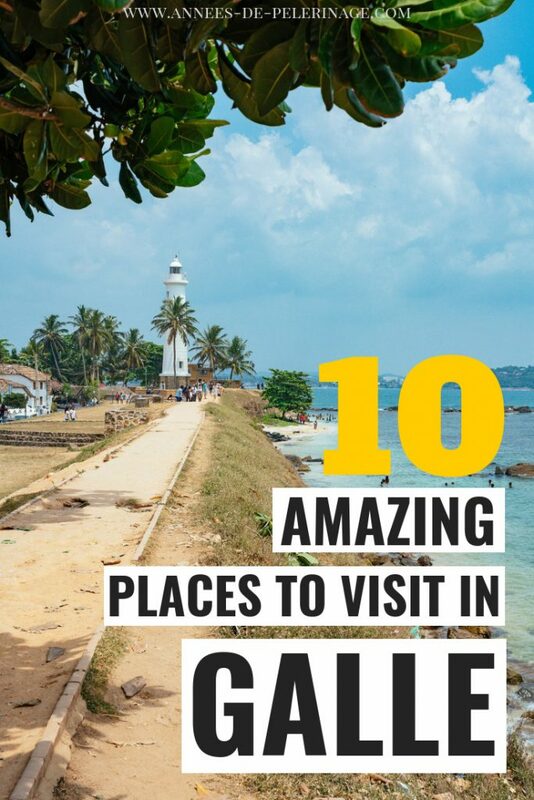 I featured Galle Fort on my list of the top 20 things to do in Sri Lanka. Pro tip: As it can be a bit hot during the day, I either recommend bringing an umbrella or doing it early in the morning. 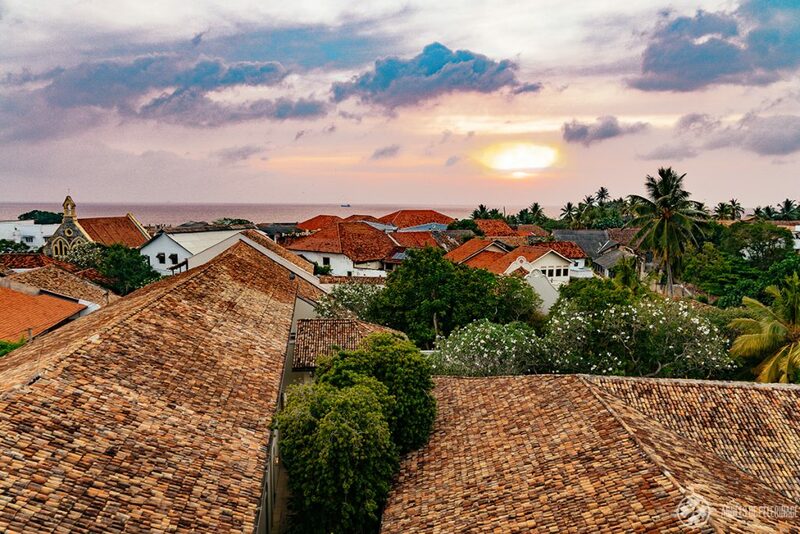 Sunsets in Galle are truly special things. On a day with good weather, the whole horizon will turn into one big fiery red. 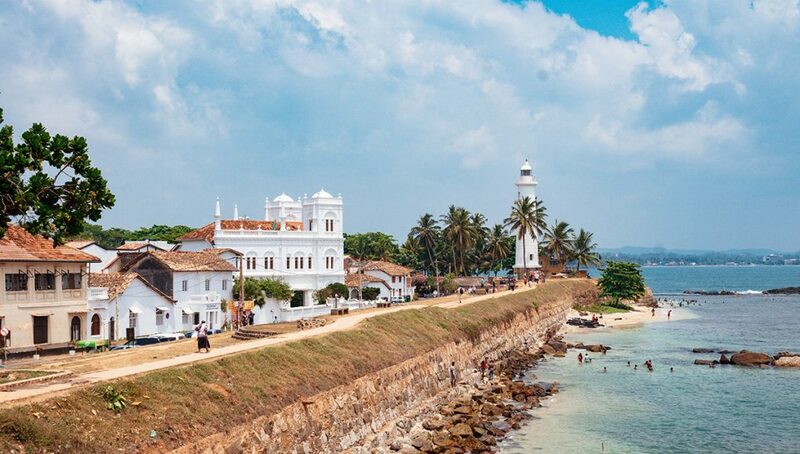 There’s no better to place to observe that spectacle than the Galle Lighthouse. You’ll see plenty of locals and tourists thronging the ramparts at this special place close before sunset. But fear not, there is ample space for all and I found Galle to perfectly safe at night. Still got qualms? 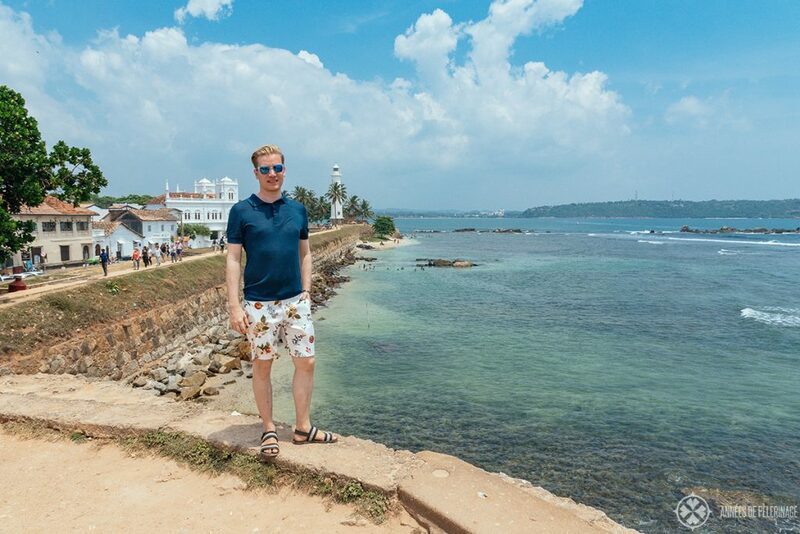 Here’s my guide to travel safety in Sri Lanka! 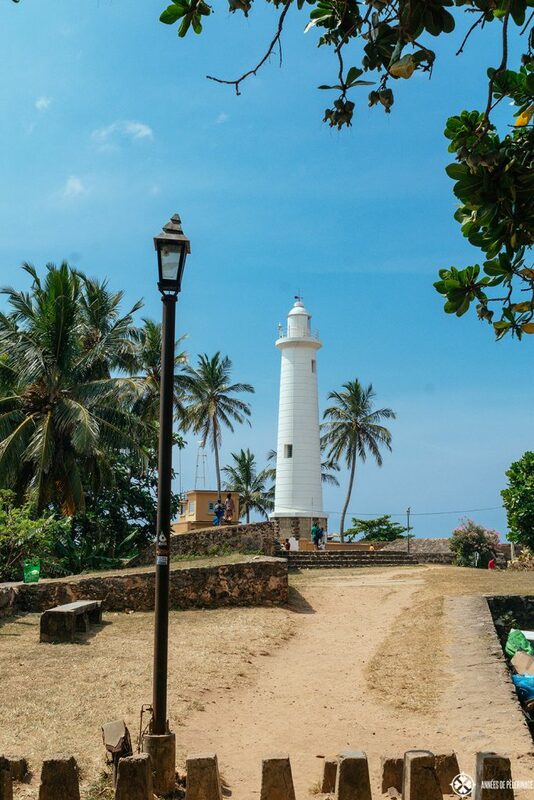 That being said, Galle Lighthouse is also worth a visit during the day. It’s not actually that big (as it might appear on pictures), but it is pretty nevertheless. 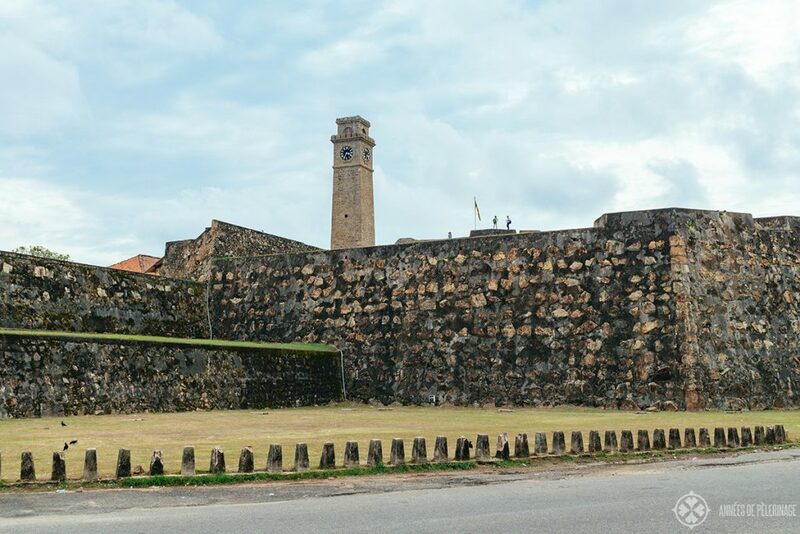 The Flagrock Bastion is the best viewpoint and this is also the place where the somewhat famous Galle Fort jumpers will start their show each day. You can also see the pretty Crow Islands from here. Also, do take note of the quite beautiful Meeran Jumma Mosque right next to it. 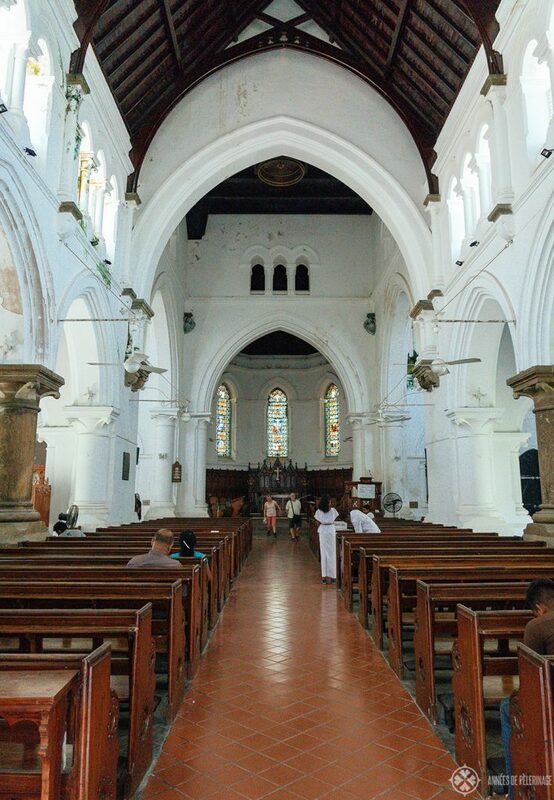 Galle, you have to know, is a place where many religions prosper peacefully next to each other. Pro tip: Another extraordinarily beautiful spot to observe the sunset is from the rooftop solarium at the Amangalla luxury hotel. It’s certainly one of the most romantic places in Galle! A testament to its Dutch and English past, you’ll find quite a lot of old churches within the old fort. While none of them will say no to a friendly donation, it’s one of the many free things to do in Galle. The Dutch Reformed Church (Groote Kerk) is a must visit. You’ll find it following church street down to the harbor from the entrance to the fort. Make sure to explore the quaint little graveyard and visit the little belfry, which stands on the other side of the road on the corner of Queen’s street. Just a few houses farther down the street, you cannot help but notice the red brick building of the All Saints Church. It’s the largest church in the fort and some might say the prettiest. I loved how children were visiting Sunday school while I was visiting and it really felt like an active tradition to me – and not some museum piece. 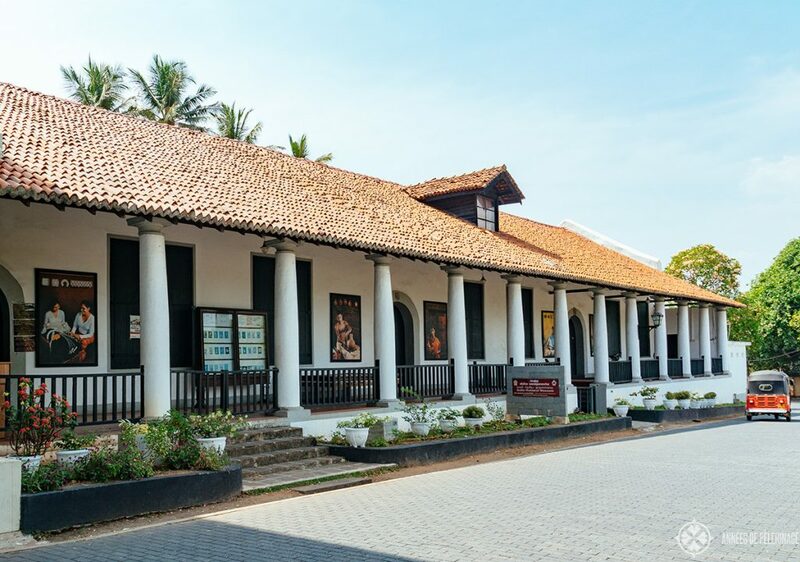 Right at the beginning of Church Street, you will find the charming little National Museum of Galle (here’s the official website). 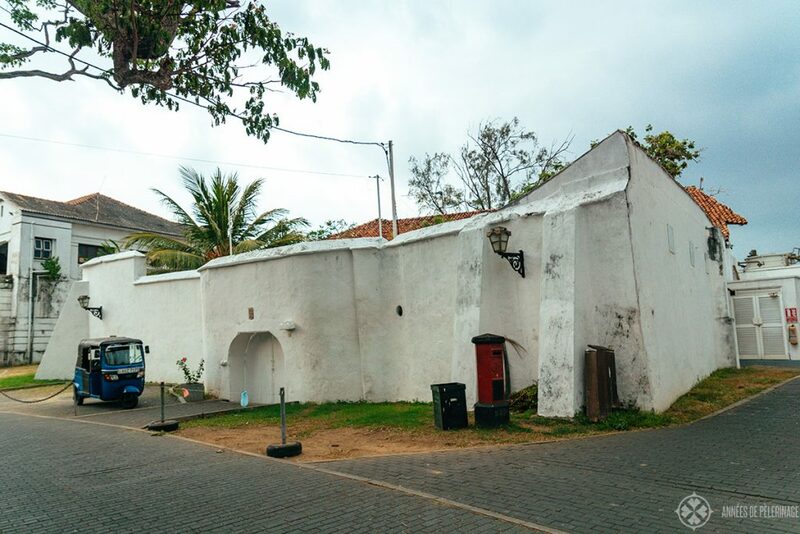 Incidentally, this is also the oldest Dutch building of Galle Fort, so it’s definitely worth a visit. Don’t expect a modern exhibition, but it may still convey a good sense of the traditional life of the natives and how things changed when the Europeans arrived. 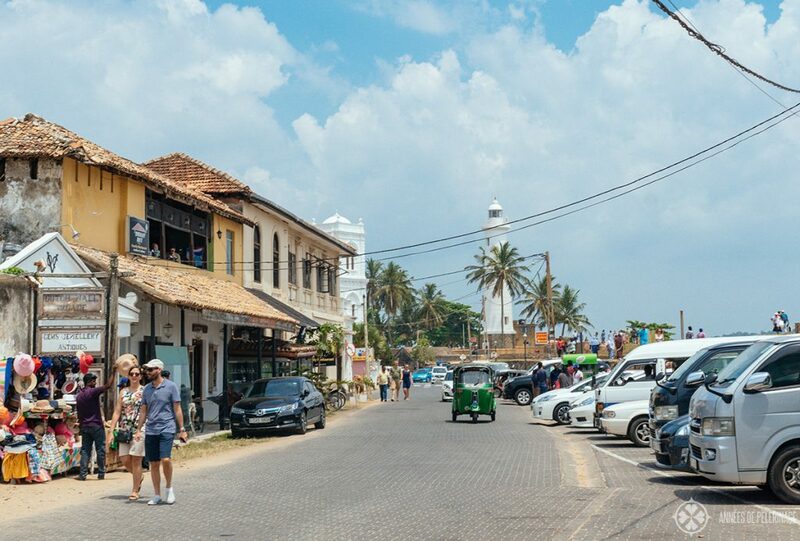 Galle is probably the best place to shop a souvenir in Sri Lanka. Pedlar’s Street is a good place to start, but basically, you’ll find little shops in about every street crisscrossing the fort. Just take your time and visit them one after another – some sell vintage posters, other unique papercrafts made from elephant poo, and yet again others Aryuveda spa products. 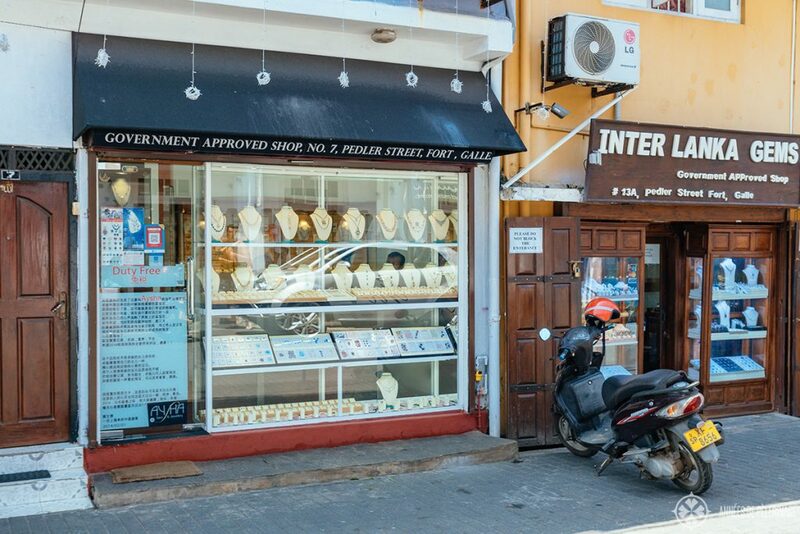 Galle is also a very good place to shop for jewelry. Sri Lanka is famous for its cornflower blue sapphires, which are prized around the world. There are quite a couple of jewelers in town, so much in fact, that you will have a hard time taking your pick. A word of warning. Many of the gemstones on sale are of a mixed quality you will have a hard time selling in the US/Europe. 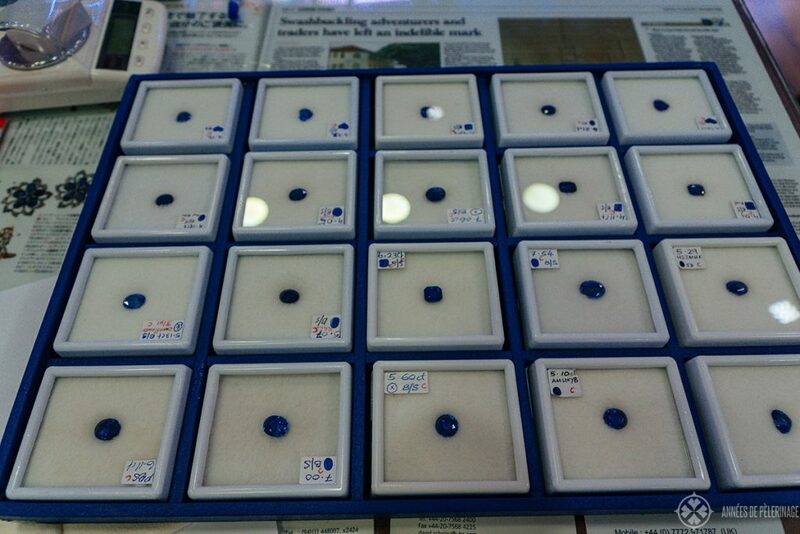 Definitely only buy sapphires with an RGL (Royal Gem Lab) certificate – especially if you are interested in bigger stones. Clarity, color, size, and treatment (or rather the lack thereof) define the price. 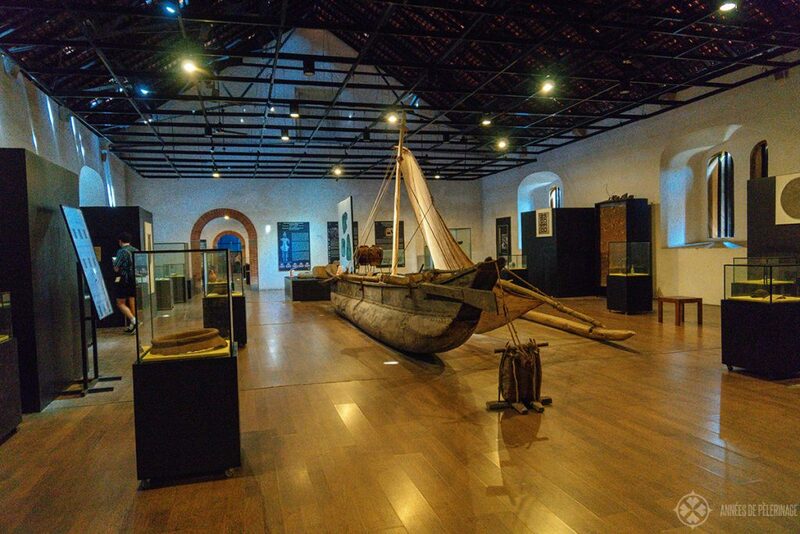 The Maritime Archaeology Museum in Galle was quite the surprise. I’ve visited a lot of small museums all over the world throughout my years of travel, and basically, I just expected some few dusty exhibits and a sleeping warden. To be quite honest with you, I just went inside to dutifully take a picture for my blog. So, this museum was quite the surprise as the collection is actually well curated and the displays quite modern. You shouldn’t expect the Mona Lisa, but all in all, you’ll learn quite a lot about the maritime history of Sri Lanka. What a nice little hidden gem! Here’s a link to the official website. Amangalla is a unique luxury hotel in the same building as the National Museum and quite the special place. It started out as the headquarters of the Dutch commanders in 1684 and their staff and was later converted into the New Oriental Hotel. If you can, you should try and stay a night (like I did). It feels a bit like sleeping in a colonial past. But if 1,000 USD a night sounds a bit too much for your budget (which is utterly okay!!! ), you should still stop by for the high tea at Amangalla. The clotted cream and scones were truly the best I ever had outside of the UK, and they even serve the famous white virgin tea of the nearby Handunugoda Tea Estate (by the way a nice day trip option from Galle). 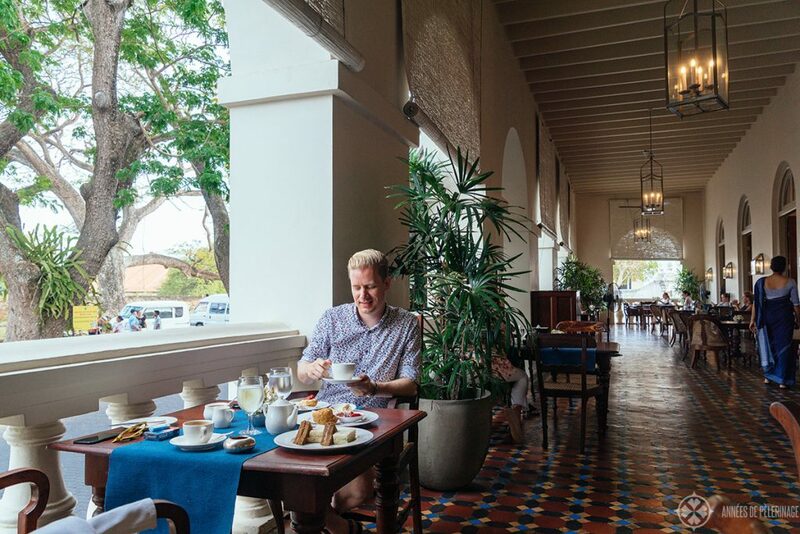 Add some finger sandwiches, and you’ll feel like a famous explorer from the 19th century taking a rest under the colonial arches of the mighty hotel. It’s a very popular spot, especially among Asian tourists. Aman also runs a beautiful beach resort near Tangalle. Read my review of Amanwella here. Beautiful as the Fort itself is, it does pay off to leave the town. 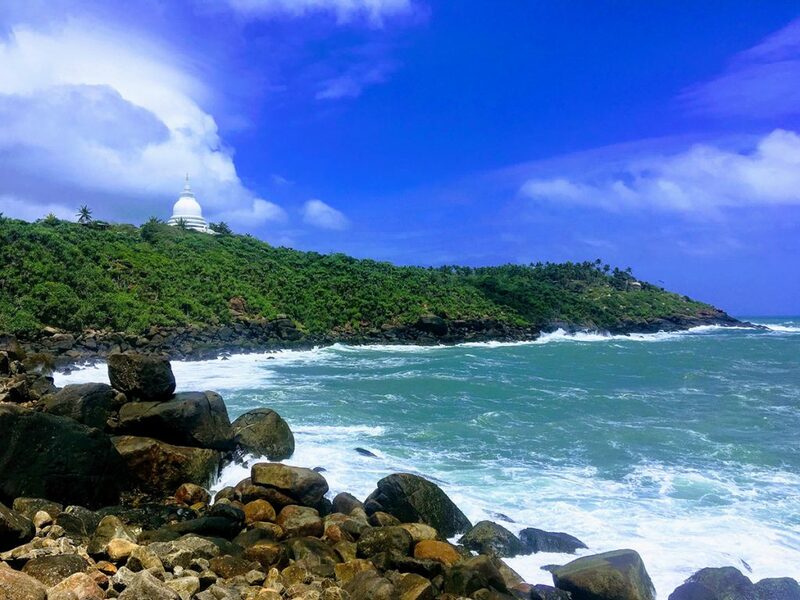 A popular spot among tourists in the Japanese Peace Pagoda overlooking Galle Bay. Many legends from around this particular spot in Rumassala, but as I am not a Buddhist scholar, I won’t try to embarrass myself here by trying to capture them. Perhaps it suffices to say that the present structure was built by a Japanese Buddhist monk of the Mayana sect in 2005. Sri Lanka was still a conflict zone back then (the civil war only ended in 2009) and they built it to, well, propagate peace. 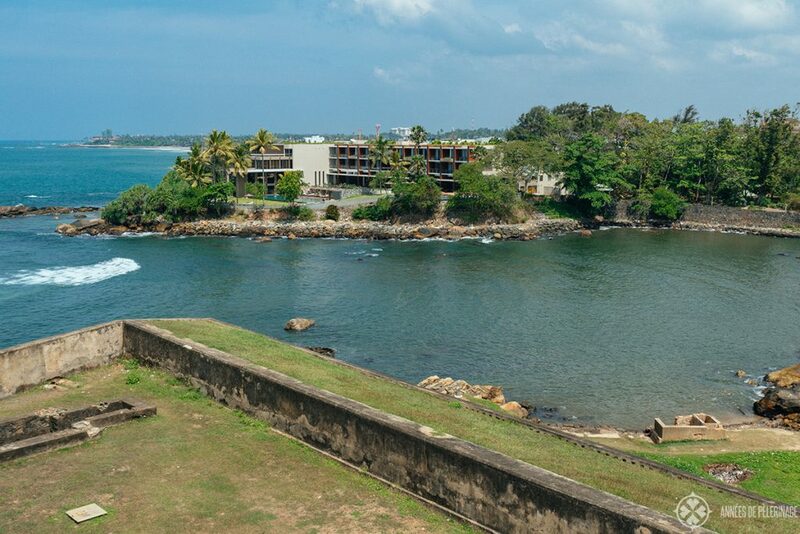 I’m not sure if the building facilitates the end of the war, but I can attest that the beautiful spot overlooking Galle bay is worth a visit. You’ll have a lovely view of the fort from here and a tuk-tuk will get you there quite quickly. You will have to scale some stairs, though. Pro tip: spend some time at the adjacent Unawatuna Beach after your visit. 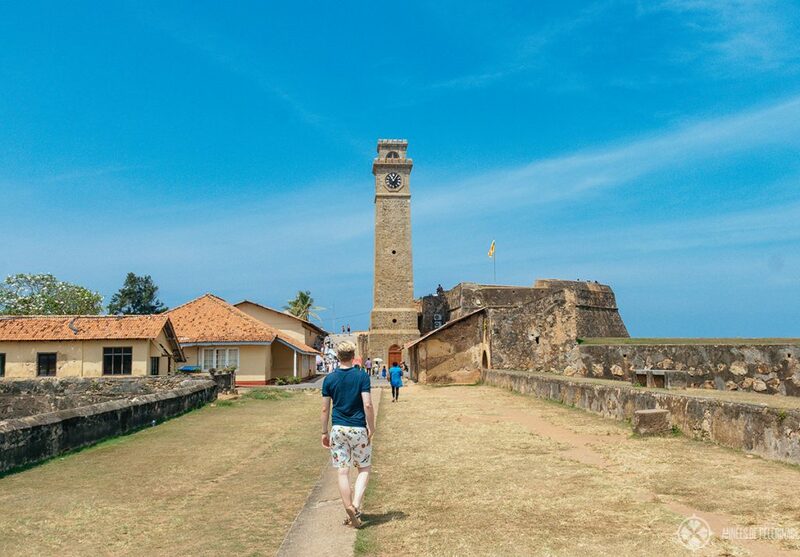 Right next to the entrance of Galle Fort, you’ll find the imposing Clock Tower of the Fort. It was erected in honor of Dr. Anthonisz – a renowned doctor who lived in the 19th century. In fact, the clock itself is a gift from an, apparently extremely grateful patient. Kindly also take note of the Star Bastion to the left of the Clock tower where once the old slave quarters (or rather what little remains of them) could be found. 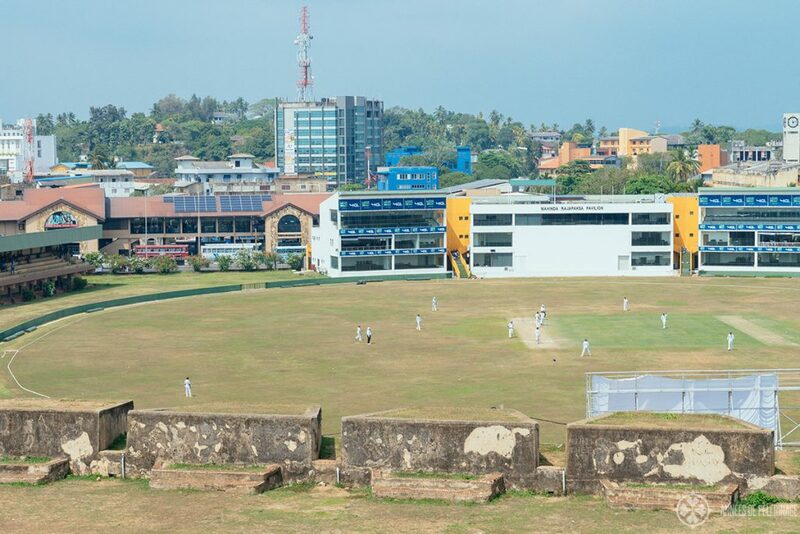 Cricket is Sri Lanka’s national sport and Galle happens to have a lovely stadium right at the entrance to the old town. If you are interested, you should get a ticket to watch a game. Or wait, here’s another pro tip: The ramparts near the Clock Tower are actually overlooking the cricket stadium, so you can basically watch a match for free from here! The nearby town of Mirissa is one of the top spots to go whale watching on this planet. Here, you can see the elusive blue whale and most of the whale watching agencies quote a near hundred percent success rate. Make of that, what you like, but it’s certainly a wonderful half-day trip from Galle you should consider. Be aware, that it will be a very touristy affair. If you want quieter wildlife experiences, I recommend you to read my Sri Lanka Safari guide. 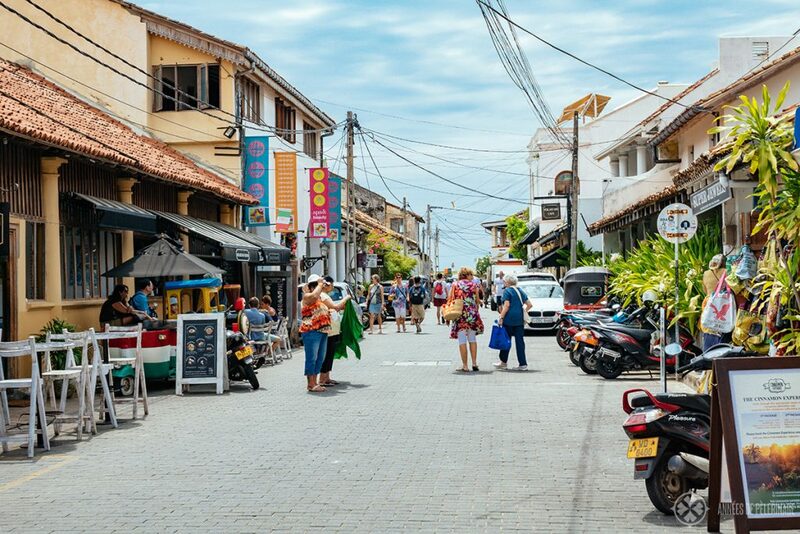 I love list, as they will give you a lovely and quick overview, but even this list of things to do in Galle skips some of the pretty landmarks in town. For example, I didn’t mention the Historical Mansion Museum, as I am not entirely sure it is not a tourist trap. The little Akersloot Bastion built by the Dutch didn’t make it on my list, even though you will probably walk past it. I also felt like the public beach at the lighthouse is nothing most tourists will feel comfortable at, even though it is popular among locals. Unawatuna Beach is probably the better alternative and only a short tuk-tuk drive away. 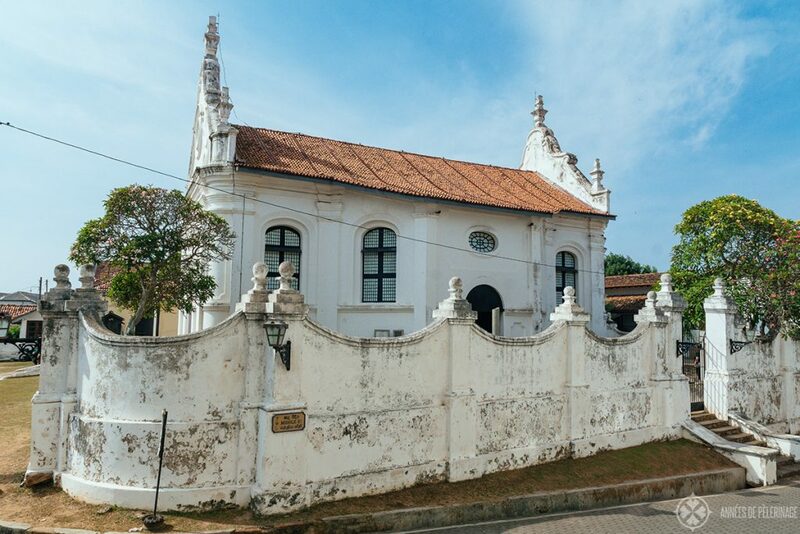 On your tour through Galle fort, you could also visit the Sri Sudharmalaya Buddhist Temple, which I didn’t feel was all that special to mention. If this is your first day in Sri Lanka, you might visit anyway and it’s not like it’s a big detour. I equally felt like skipping the St. Mary’s Cathedral outside the fort. It’s a beautiful building you may see from the ramparts, but I am not sure most tourists would feel it’s a good use of their time. 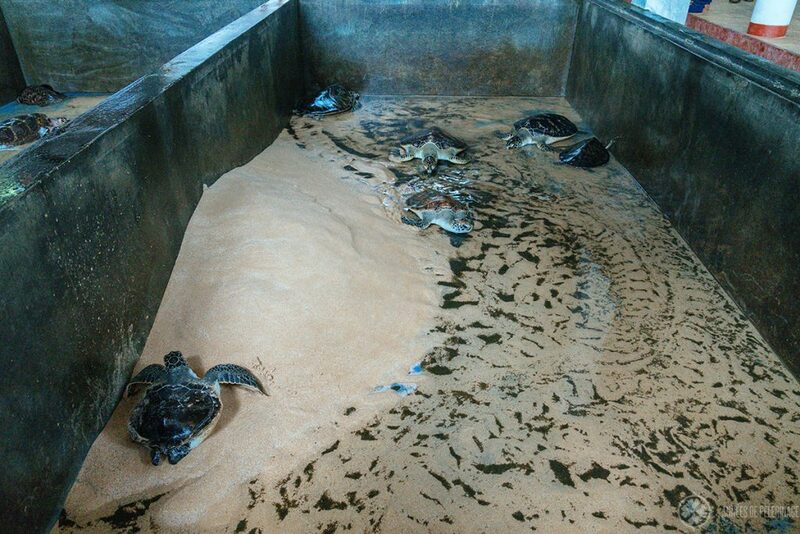 I explicitly didn’t mention the many Sea Turtle Hatchery along the cost between Galle and Matara, even though you will see tourist agencies advertising them. I have been to two, and while some of them probably do some good (namely, keeping the locals from eating the tasty eggs), I’m not convinced they are working in the sole interest of the turtles. Then again, if tourists stop coming to these places (and not paying money), maybe these private initiatives might stop protecting the nesting ground, so I dunno. 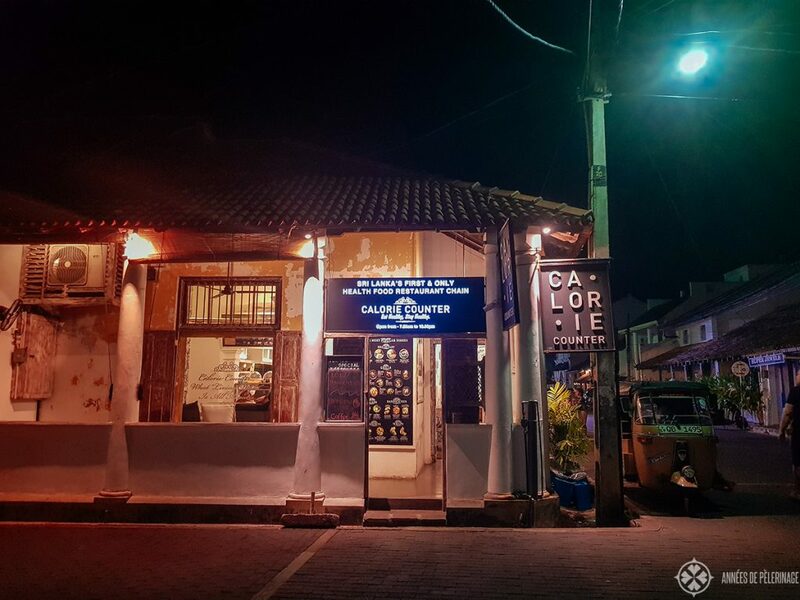 There are quite a lot of little restaurants, cafés, and bars around Galle fort, so you’ll have no shortage of places to eat in Galle. I have to admit, I wasn’t able to sample them all during my stay, so I’ll just mention those I liked. Pedlar’s Inn Café on Pedlar’s Street was lovely – not only because of the vintage car in front of the entrance. The Heritage Cafe and Bistro on the same street was also quite special, though a tiny tack more western. 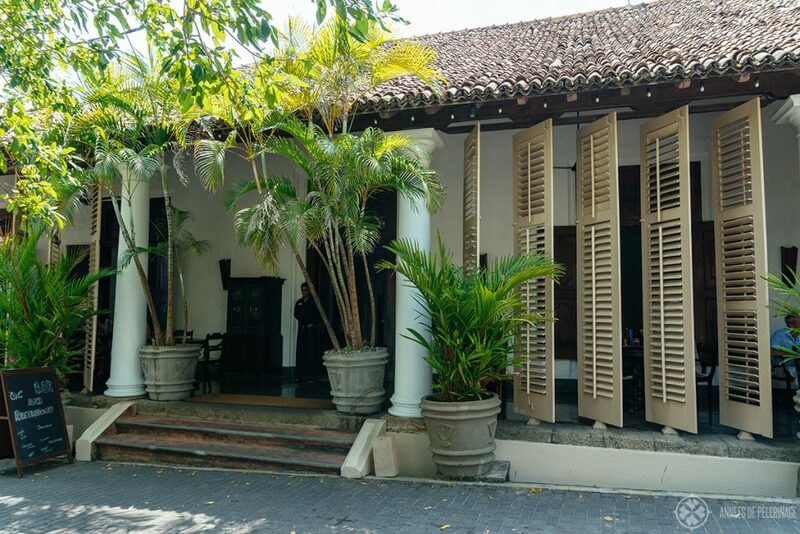 Naturally, I also enjoyed my evenings at Amangalla, and if you want to step down into Galle’s colonial past, there is no better place to dine. Galle Fort Hotel would be a good alternative, though I only had a cocktail there. If that’s too expensive, you might try the Calorie Counter on Pedlar’s street. The Secret Garden Fort was also quite popular among tourists, though I didn’t like it. Maybe it was too much of a backpacker haven for me, but I dunno. 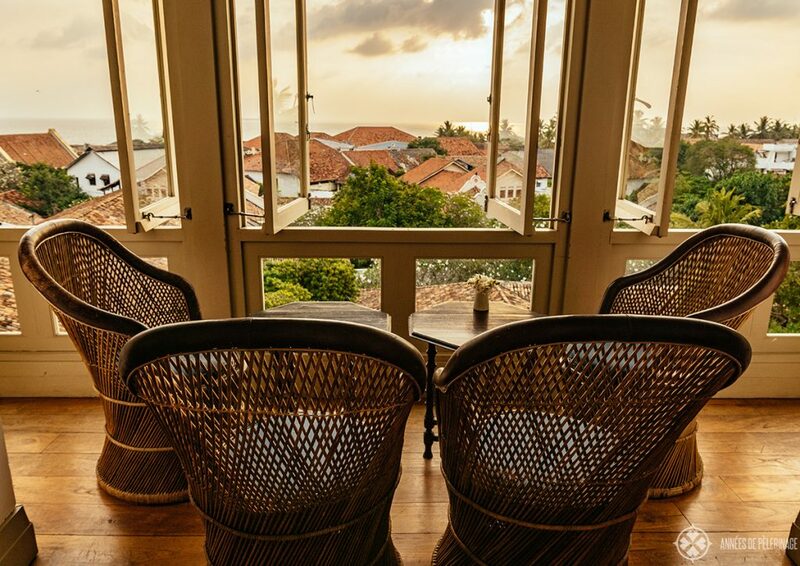 Of all the Galle Fort hotels, Amangalla is truly the best. There’s history, there’s perfect service, there are spacious rooms, there is a fantastic spa and a huge pool, there’s basically everything you need in one ancient hotel. The price is quite staggering, but I enjoyed every single minute at the hotel and would gladly spend a week. 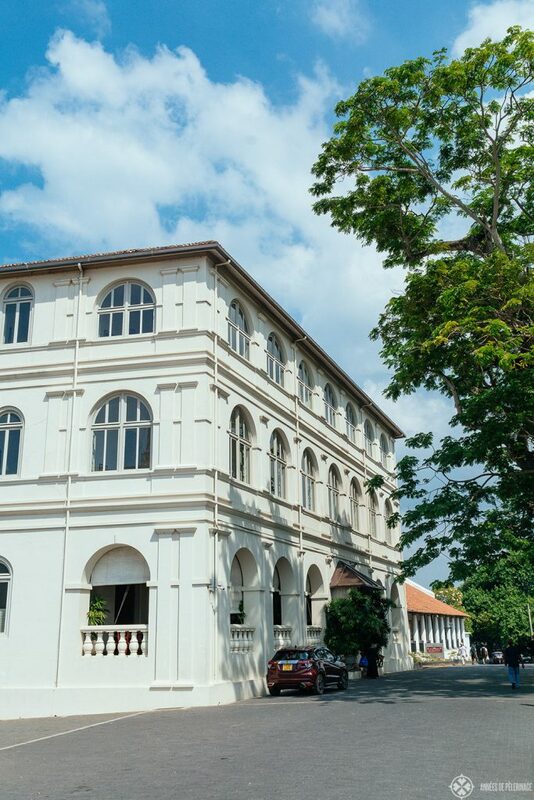 A very good luxury alternative is the Galle Fort hotel (click for prices & more pictures) just a couple of meters down the road and probably the second best hotel in Galle. It’s certainly not cheap either, but I feel that staying in an old Dutch mansion greatly enhances your time in the Dutch fort. 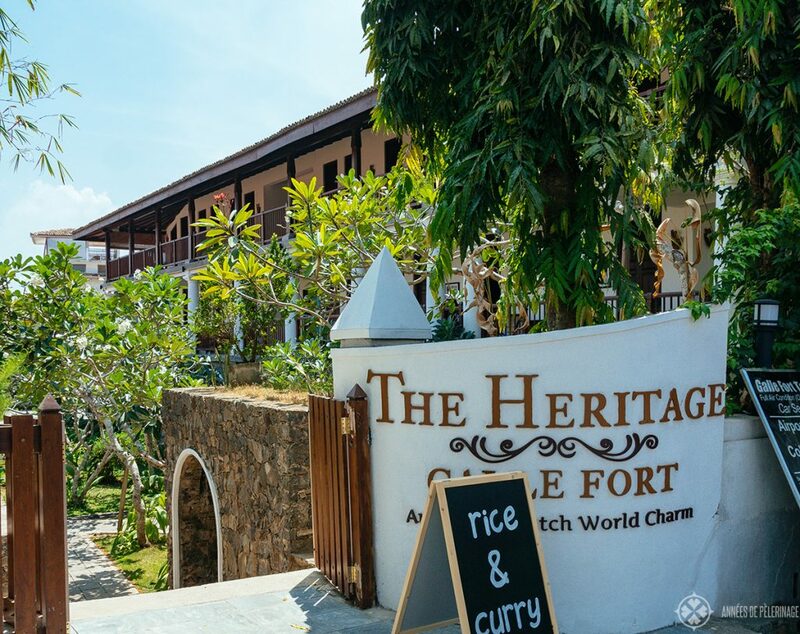 A very viable mid-price option would be the Heritage Hotel (click for prices & more pictures) right opposite the Galle Fort hotel – it’s not actually inside an old mansion, but quotes the colonial-style in a very lovely manner. If you are looking for a hotel with a nice pool a bit on the outskirts of Galle (where it is admittedly a bit quieter), then I found the Le Grand Galle quite charming and the location is hard to beat (click for prices & more pictures). I mean, seeing the fort from the pool, how great is that? As budget hotels are not my expertise, I leave exploring booking.com for cheap hostels and guest houses to you. 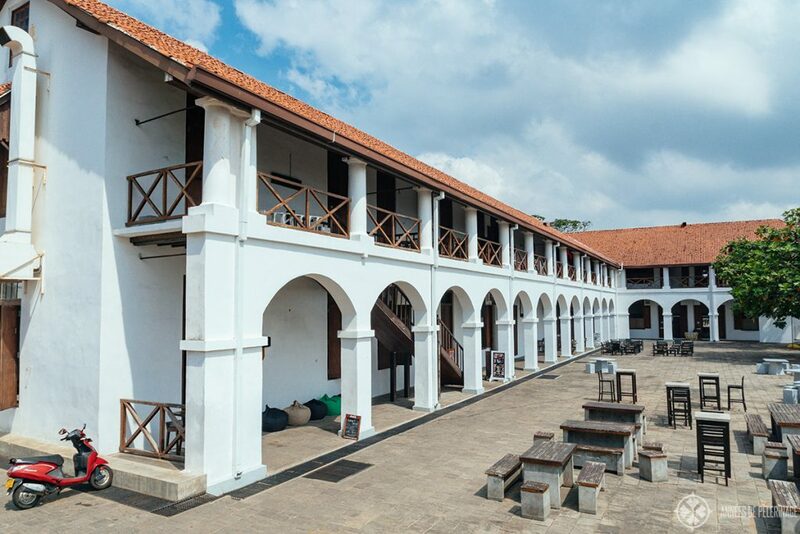 It suffices to say, that there are in fact quite some of them inside Galle Fort. That being said, the Sunset Fort looked lovely from the outside (click for prices & more pictures), and I could well imagine frugal travelers enjoying their stay here. 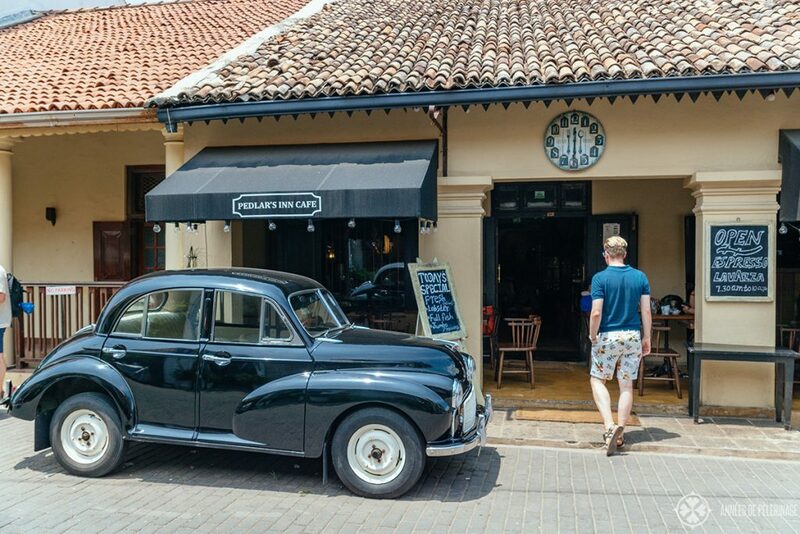 There are three easy ways to get from Colombo to Galle: By taxi, bus or train. It really depends on your budget and how much time you got. If you plan to do a day trip, then taking the taxi from Colombo to Galle is probably the best and fastest alternative. Expect prices around 70 to 100 USD one way. Depending on the traffic, it may still take 3 hours, though a bit under 2 hours would be the norm. You can also travel by bus – while there are tourist agencies offering day trip excursions (some of them quite a bargain), you can also opt to take the public bus. Southern Express Buses operate between Maharagama Bus Station near Colombo and Galle. A ticket is just about 3 USD so extremely cheap. It can be a bit inconvenient with big luggage, though. Probably the fasted and easiest way is Colombo to Galle by train. 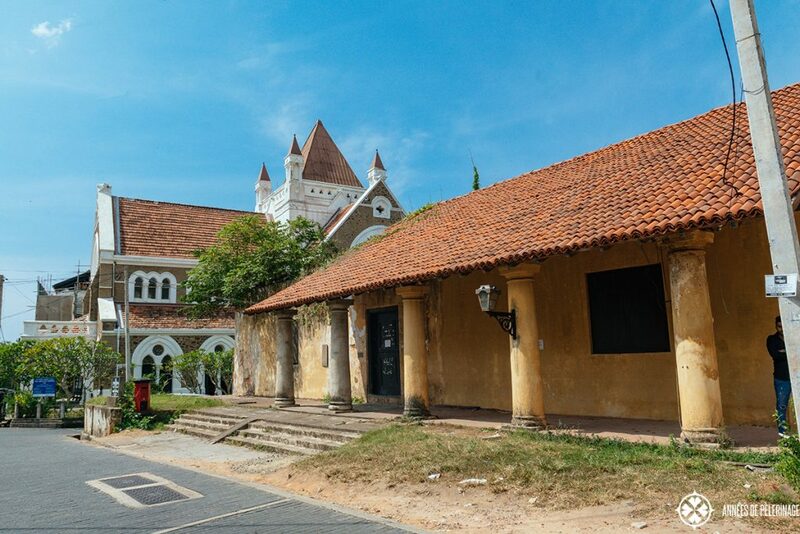 There is a direct connection to the Dutch Fort from Maradana Station a couple of times a day for the equivalent of roughly 1,5 USD. You’ll probably have to be early and fight for seats, but it’s quite the scenic route. 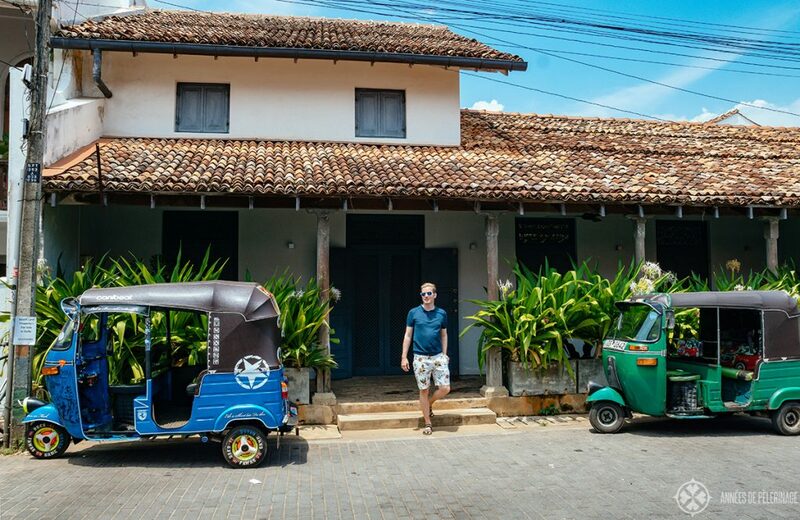 Okay, guys and girls, this was my little guide to the best things to do in Galle, Sri Lanka. Hope you liked it. Got any questions? Make sure to comment below!